In a Strange Land: Nonlinearity in Online Chat: Why a Problem? I'll soon be posting the transcript for our session about using SL to prompt student reflection. Out of the chat nearly 30 of us had, however, one clear issue emerged: some of us who are not students have difficulty focusing, let alone reflecting, in a text-chat moving, and often digressing, at lightning speed. Perhaps because I taught for years with Daedalus Interchange, synchronous conferencing has been one of the few forms of multitasking I am able to manage. I can "surf" the multiple threads for the gist of what has been said, or I can follow a single thread in the tapestry. Such shifting was essential to teaching with Interchange or my text-only virtual Beatnik coffee shop on the campus MOO (remember those?). MOOndog's Coffee Shanty is way gone, daddy, but my friends will want to visit the page and howl at my cyberhipster lack of design skills, circa 1996. In such environments, however, I'd do something I've not tried in SL: jumping between groups, so I might be part of up to three conversations at once. It's like, man, drumming. You focus too hard on finding one and you lose it, dig? Just play with one hand and, like, forget it is doing its thing. Miss a beat, daddy-o, and you'll get it again when you come in at one. Then let your other hand just, you know, play. 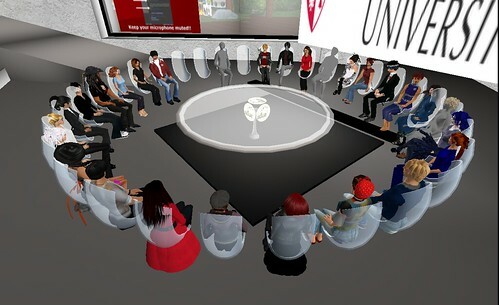 Others clearly cannot always follow such chaos as it unfolds, and some VWER members ask for more meetings with one person speaking at a time. I disagree, because that tends to favor only the strongest voices (I'm one of those, btw, being fearless--or foolhardy, one--with a microphone or podium). Yet not all of us are, and on typed conferences a number of researchers have discussed why shy participants can find a voice. Where else does something like synchronous conferencing occur? One cannot follow the flow of 20 people speaking simultaneously; the result in babble. Text-chat logs have always been a key element to making chat useful for study or as a source in a more formal project. Studying the log leads to moments of insight and connection that may not happen during the staccato pace and sequencing of the original event. It's one reason why academics love the text-chat of Second Life and other virtual worlds. I've waxed poetic about the pedagogical value of transcripts in an article published online a few years back. Voice is harder to record and sift for the pithy quotation or useful fact. Problem? No. My only problem is that I'd rather be drinking coffee with some Beatniks.